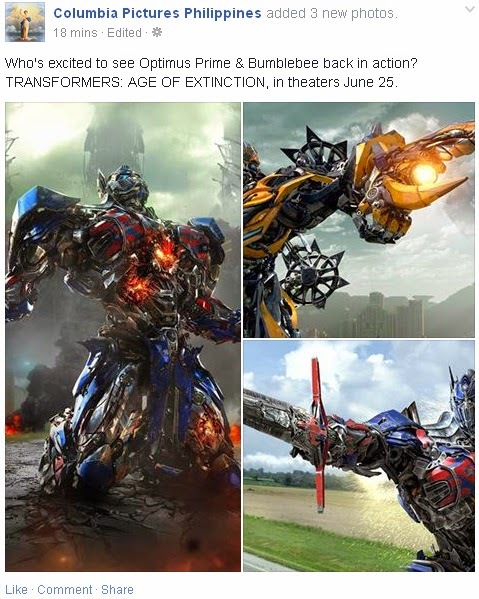 There is no official release but a couple of minutes ago Columbia Pictures Philippines posts an announcements about Transformers Age of Extinction. Yep we are assuming the TRO against UIP movies is already done and not only that, but probably UIP movies are officially to be distributed by Columbia Pictures who's also distributing movies from Disney and Sony Pictures. Again there are no official releases but one thing is for sure, Transformers Age of Extinction will be distributed by Columbia Pictures and will be released on June 25, 2 days ahead US releases. We will update this if we finally get an official confirmation from Columbia Pictures Philippines. Oh God is really good.